The Connemara Hotel main block before remodelling began in 1934. 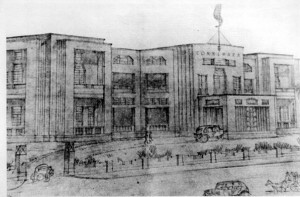 Jackson and Barker’s sketch of what the remodelled Connemara (1930s) was expected to look like when completed. Like the legendary Phoenix, Chennai’s iconic hotel, now called the Taj Connemara, has gone through as many transformations as the City itself. It started as a garden house built by John Binny, a surgeon attached to the Nawab of Wallajah’s court. When Binny became the Sheriff in the early 19thCentury, the Nawab gave him the land on which he built a suitably grand mansion. In subsequent years the house passed through different hands to become the Imperial Hotel, (1867-1886), the Albany (1886-1891) and finally the Hotel Connemara in 1891 when it was purchased by M/s Spencer & Co.
Lord Connemara was the Governor of Madras from 1886-1890 and has left his stamp and his name on other well-known landmarks of the City. It’s however Lady Connemara’s spirit that walks the corridors of the hotel even after the long passage of time. As the second wife of the honorable Governor, she created a minor scandal by leaving the Governor’s residence and taking rooms at the hotel then known as the Albany. One of the delightful aspects of the newly renovated hotel are a set of public spaces named after her – the Lady Connemara Bar and Lounge that together replenish the spirits and the romance of the past with style. As S. Muthiah has had the pleasure of recounting in the past; “It was not Oakshott representing the Spencer’s who bought the property, but Oakshott himself. 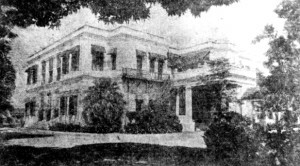 The land he bought from Triplicane Ruthnavaloo Moodelliar in April 1891 was 6 cawnies for 21 ½ grounds in extent, a bit less than 9 acres.” It was sold to Spencer’s in 1913. In between the war years, it became the leading establishment with separate quarters for Families and Bachelors, boasting of a Tennis Court and a well laid out garden where tea and light refreshments were served. The Art Deco style that was in vogue became a design feature of the Hotel that has been continued to this day. There were variations when Geoffrey Bawa took over the renovation with the addition of a new residential wing in the style that he popularised as “Tropical Modernism”. Sue Freeman, the British designer who has nurtured the hotel in the past, has created a charming medley of all these different aspects in her cool and elegant approach to the latest re-invention of the Connemara. It’s probably seen at its best in the Lady Connemara Lounge, an oasis of sage greens and pale magnolia set in a drawing room that Lady Anna Maria Russell, 7thDuchess of Bedford, would have enjoyed. As the Menu card reminds the guest she was the one who felt the need to assuage what she called ‘that sinking feeling’ between lunch and dinner, by inventing a ritual called the “Afternoon Tea”. It was also a time at the height of the Victorian era to display the avant-garde style of Darjeeling tea served in exquisite porcelain with a silver service, embroidered linens and, of course, a Butler to serve the tea cakes and crustless sandwiches. It’s not Lady Bedford who stares down at the modern-day guest who needs to satisfy his or her “sinking feeling” between 3 pm and 5 pm at the Lady Connemara Lounge, but the Prince of Arcot, the old Nawab of Wallajah. What he makes of the salmon sandwiches, the scones, the jam and clotted cream is hard to say. Maybe he would thoroughly approve of the specially plucked and decanted brews of a single estate tea from Valparai, or the coffee from the Yanagundi estate in Coorg. For, more than anything else, the Nawab was someone who enjoyed sharing the good life with his guests.